Keeping up with your buddies on IntenseDebate is a piece of cake. As an IntenseDebate or WordPress.com user, you can follow your fellow commenters and opt to receive a feed of their comment stream in your IntenseDebate dashboard. Visit their profile and select the Follow button on the left. You can hover your mouse cursor over their profile picture in the comment section, and a menu will pop-up. Select the Follow button in the menu. You can find out which users are following your comment stream at your Following Page. You will see two lists: who you are following, and who is following you. You can stop following a user’s comments at any time. Visit your Following Page and select the Stop Following link to the right of their name. 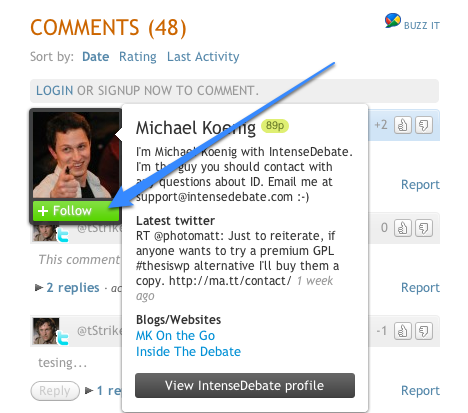 IntenseDebate has a public profile system, so comments you make are visible through your public profile. Currently we do not offer a way to hide your comments or block someone from following you. We are considering this for future development, so if you’re interested let us know. Tags: Accounts, Comment Feeds, Social — Can't find your answer here? Let us know.